The first verse we can understand in a much broader sense by extending this prohibition to include misleading the spiritually blind. Indeed, our sages teach us that this is the extended meaning of this passage and that we should be ever on our guard against misleading someone who does not have the spiritual capacity to discern our actions. This passage is about leading someone astray. We should not lead a spiritually blind person down the wrong path. The second verse, however, seems to merely be a rebuke against anyone failing to uphold the commandments of the Torah. How are these two related? Moses ben Nachman, otherwise known as Nachmanides or Ramban, understands the phrase “anyone who does not confirm the words of this law” to apply to anyone who has the ability to influence others to follow the path of Torah, but chooses not to. He says that it applies especially to those who are well-studied (but only concerned about their own spirituality) and to those in leadership roles. 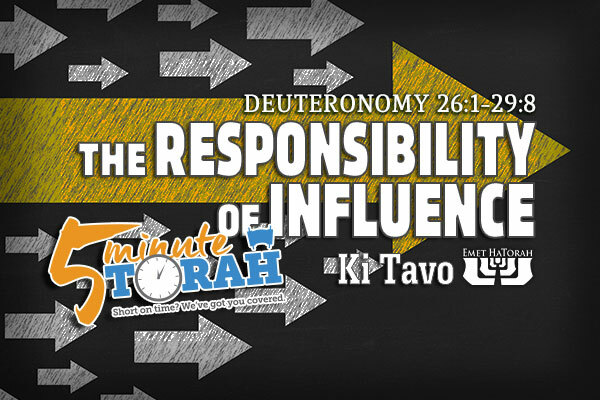 Rather than simply being a rebuke against failing to observe the Torah’s instructions, Ramban understands this to be a rebuke against passiveness in our responsibility to influence others for the good. Let’s face it. Leadership is influence. Leaders are held to a higher responsibility because of this. The behavior of a leader influences the behavior of their followers, either positively or negatively. If a person is truly a leader, it doesn’t take much effort for to influence people to take action. They can either lead people to Torah and mitzvot or lead them to a path of destruction. But this is not limited to those who are in the limelight. We are all leading people one direction or another, because we all have some sort of influence. Some of us have a greater influence over people than others. Some of us have an influence over larger numbers of people. But neither the magnitude nor the volume of people we are influencing negates this principle. We have a responsibility to lead the blind on the proper path and uphold the words of the Torah in the eyes of all who see us. We must take this responsibility seriously. If we are cognizant of the fact that we are influencing others—either for the good or for the bad—then we should be using that influence to lead people on a path that will bring them into a closer relationship with their Creator. How will you use your influence today?